If you're considering starting a blog, it's a good idea to take some time learning blogging basics. There's more to planning, setting up and maintaining a blog than simply writing blog posts! Whether you want to blog about celebrities, politics or gardening, you can follow this simple guide on how you can start your own successful blog and continue building on its success for years to come. Anyone can sign up for a free blog account and immediately start blogging. However, many blogs typically end up lost and forgotten, collecting virtual cobwebs in some dark corner of the Internet. Successful blogs are run by bloggers who understand, and closely adhere to, blogging basics that include proper planning, appropriate set-up, frequent updates and relentless promotion. So you've made the decision to start a blog. Being a blogger can be an exciting and rewarding experience. Some people write a blog only as an online journal and don't really care whether or not people read it. Other people want to have a blog that attracts crowds of readers and generates interesting discussions. If you want to draw a lot of traffic, or if you'd like to generate ad revenue from your blog, then it's important to consider the following factors when selecting a topic. Is the topic overpopulated? Carefully research the general topic that you want to write about. Use Google's Keyword Research tool as part of your research and try to avoid overly general topics that have high competition. Your odds of competing well within those topics with a new blog is minimal. Use Google's keyword suggestions to identify less competitive topics related to your niche. Is the subject relevant? Avoid topics that are overly obscure and esoteric, as few people will be searching for such subject matter. While you don't have to choose topics that have broad-reaching mainstream appeal, the subject matter should be relevant to a large enough demographic that you give yourself a fair opportunity at attracting a lot of traffic. Do you have plenty of content? When you choose a topic for your blog, it should be a subject with a lot of potential sub-topics that you could explore and write about. One of the most common reasons many new bloggers fail is because they run out of things to write about. Are you passionate about the subject? Bloggers who have an intense interest in the subject of the blog are very successful, because they can motivate themselves to write about the topic almost every day. If you are simply chasing a popular topic just because you think it will get you noticed, you will likely get disheartened if you don't attract the kind of traffic that you wanted. Honest and true passion for your topic will get you through these rough patches. When you know what you want to write about, and you know that there's an audience for what you have to say on the topic, you're ready to move on to the next step - setting up your blog. You'll need to decide whether or not you want to establish a free or a self-hosted blog. Free blog: There are a number of free blog platforms to choose from. Blogger, Wordpress.com and LiveJournal are three leading no-cost options that offer extremely simple setup and configuration. The one major drawback with free blogs is that they are hosted on a web host that you have no control over. This means that even if you spend years developing a great deal of content for your blogs, you always run the risk of having it deleted if the blogging site ever goes defunct or simply decides to remove existing blogs. Additionally, opportunities for monetization are limited with this approach. Self-hosted blog: A self-hosted blog is one where you upload and install blog software to your own web hosting account attached to your own domain. The advantage to this approach is that you control the entire blog and everything contained within it. The drawback of self-hosting a blog is that you need to be a bit more knowledgeable in how to set up and configure a new blog on your own hosting account. This can involve adding tables to an SQL database, uploading and installing templates, and sometimes even editing the raw code within the blog template. Self-hosted blogs are not for anyone who feels weak in the knees about web programming, though some web hosts offer tools like Fantastico that can simplify the process. Once you've set up your blog, you'll need to figure out a way to update it with fresh content constantly. 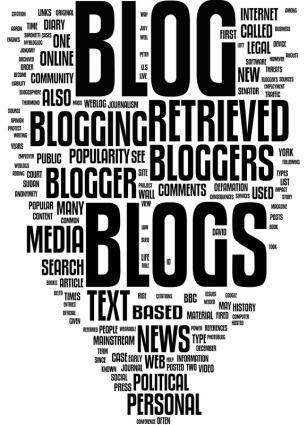 Most successful blogs are updated at least two or three times a week. Some are even updated several times a day. The highest quality blogs are usually those where a blogger (or a team of bloggers) writes all of the original content. Research popular keyword searches and write blog entries based on those. Subscribe to other popular blogs in your niche to get inspiration for your blog post ideas. Follow any news or announcements relevant to your topic and report on these findings on your blog. Add your own personality or spin to every post, ensuring that your blog is unique and not simply regurgitating what can be found elsewhere on the Internet. Provide value to your readers by writing useful how-to guides and tutorials. Add a widget that posts Twitter updates (either your own or people you follow) to your blog. Maintain a journal or list of blog post topics, so you'll always have "extra" ideas on hand. Pre-write several blog posts in advance when you're feeling particularly inspired. These saved posts can be published at a later date when you're not feeling as inspired. While most of the effort of blogging is in constantly publishing interesting and fresh content, much of the real success of a blog comes from promotion. Blog promotion takes many forms and it's limited only by your imagination. Create a Facebook page for your blog and provide updates every time you publish a new blog post. Leverage Twitter and other social media to actively promote your blog. Converse with other people interested in your topic or niche. Participate in LinkedIn groups that appeal to other bloggers in your niche, as well as to potential readers. Write guest articles that can then be published on other relevant blogs and article directories related to your chosen topic area. Participate in social media and forum discussions to establish yourself as an expert in your field. Be sure to include a link to your blog in your signature. Comment on other blogs related to your niche to help get your name and the name of your blog "out there." Use Google Alerts to monitor certain keywords and mentions of your blog and respond accordingly. Run contests and giveaways to help promote your blog and build brand awareness. Have blog business cards that you can give out at networking events and blogger meetups. Buy advertising on other websites to promote your blog. Attend relevant industry events and network with like-minded individuals. The most important thing to remember about blogging basics is that your own blog is only one part of a very large, worldwide blogging community. By interacting with other bloggers and taking an active part with other blogs, you may find that your own blog is generating a great deal of traffic and great reader comments as well. As you blog starts to grow, you'll be able to begin looking for ways to make money from your efforts.